A file with the Themepack file extension is a Windows Theme Pack file. They're created by Windows 7 to apply similarly themed desktop backgrounds, window colors, sounds, icons, cursors, and screensavers. Some Windows themes use the older .theme file extension, but those are just plain text files. They describe colors and styles that the theme should have, but since plain text files cannot hold images and sounds. Theme files just reference images/sounds that are stored elsewhere. Windows stopped using .themepack files in Windows 8 and replaced them with themes that have the .deskthemepack extension. Themepack files do open in Windows 8 and Windows 10 just as they can in Windows 7. This is done by just double-clicking or double-tapping the file; another program or install utility isn't necessary for the files to run. The newer .deskthemepack files are not backward-compatible with Windows 7, which means that while .themepack files can open in all three versions of Windows, only Windows 8 and Windows 10 can open .deskthemepack files. You can download free themes from Microsoft in both the .themepack and .deskthemepack formats. Windows uses the CAB format to store the contents of Themepack files, which means they can also be opened with any popular compression/decompression program, the free 7-Zip tool being one example. This won't apply or run anything inside the Themepack file, but it will extract the wallpaper images and other components that make up that theme. If you have a THEME file that isn't a Windows theme, it may instead be a Comodo Theme file used with Comodo Internet Security and Comodo Antivirus, or a GTK Theme Index file used in GNOME. If you find that an application on your PC does try to open the Themepack file but it's the wrong application or if you would rather have another installed program open Themepack files, see our How to Change the Default Program for a Specific File Extension guide for making that change in Windows. If you want to use a .themepack file in Windows 8 or Windows 10, there's no reason to convert it because they're already compatible with those versions of Windows just like they are with Windows 7. However, you may want to convert a .themepack file to a .theme file. You can do that with the free Win7 Theme Converter. After you load the Themepack file into that program, place a check on the Theme output type and then click or tap Convert to save the Themepack file as a Theme file. If you want to use the newer .deskthemepack files in Windows 7, the easiest thing to do, instead of converting the .deskthemepack to a .themepack file, is to open the .deskthemepack file in Windows 7 with the free Deskthemepack Installer tool. Another option is to open the .deskthemepack file in Windows 7 with a file zip/unzip tool, like the 7-Zip program mentioned above. This will let you copy out the wallpapers, audio files, and anything else you want to use in Windows 7. 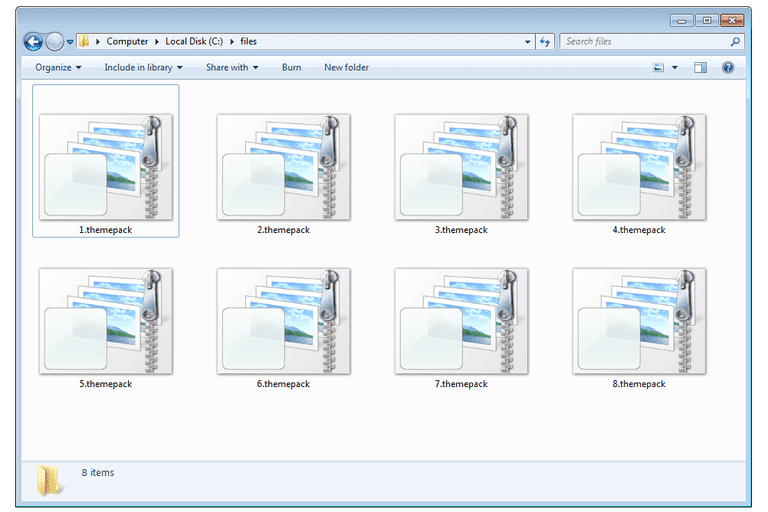 The background images in a .deskthemepack file are stored in the "DesktopBackground" folder. You can apply those images to Windows 7 as wallpapers like you would any picture, through Control Panel's Personalization > Desktop Background menu. If you need to convert the wallpaper images or audio files into a different file format, you can use a free file converter.